As mentioned a couple of weeks ago, Toool visited the Dutch Ankerslot factory. It is nice to see they have come up with some clever techniques to solve problems. Take for instance their electro-mechanical lock. Their system uses both a mechanical protection as well as an RFID chip. As being pioneers in this area (in the Netherlands? ), they encountered the problem of welding/glueing RFID elements in the head of a key. If the glue is too aggressive, or if the temperature to weld the two parts together is too hot, the RFID element could be damaged. And then there is the risk of the head of the key splitting apart, causing the user to loose the RFID chip. The way Ankerslot solved this is by ultrasonic welding. Two plastic elements are rubbed against each other at very high speed, causing them to become very hot for a very short period of time, on a very specific area. This fast rubbing causes a nasty high tone squeak. But after this short burst, the parts are stuck together in a way they will never be separated again. As always I shot some video of this process (Quicktime 7 Mb or click the above youtube clip). And WikiPedia has the answers for people who really want to know everything about Ultrasonic welding. I am still busy trying to get better impressioning marks using ultraviolet light. 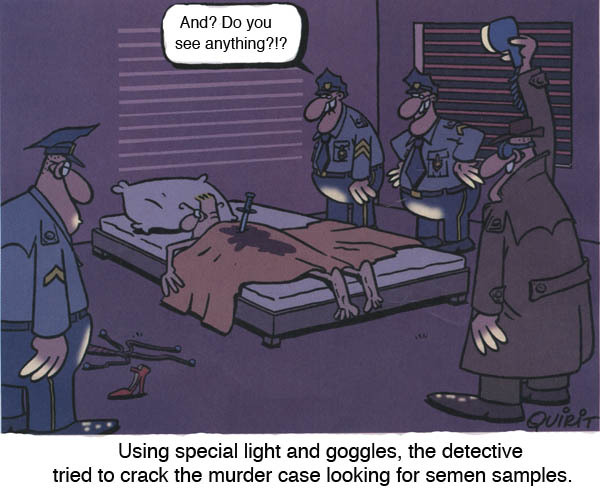 Below is a cartoon from a Dutch magazine, and CSI also seem to be using UV for better traces. It took me a little while to figure out the joke, but I think it is very funny. I just hope you have the same sense of humor …. An interesting article describing the struggle againts black box e-voting in the Netherlands. Written by my good friend Rop Gonggrijp (the driving force of the ‘against e-voting campaign’ in .NL). My most recent confrontation with what it means to be a hacker started in March of 2006, after I went to vote for the local council of Amsterdam. At the polling station, I had to use a brand-new electronic voting machine that the city was renting from a company called Sdu. In fact, Amsterdam had contracted the entire election as a turnkey service, Sdu was even training the poll-workers. This “voting machine” was in fact a computer with a touch screen running Windows. To make maters worse: inside each computer was a GPRS wireless modem that sent the election results to Sdu, which in turn told the city. I had not been blind to the problems of electronic voting before, but now I was having my face rubbed in it, and it hurt. Perhaps I should quickly introduce myself. My name is Rop Gonggrijp and I’m a dutch national that lives in Amsterdam, The Netherlands. Some of you will know me as I have been mentioned in this magazine as well as been a regular guest on Off the Hook for almost as long as the show exists. I’m one of the main organizers for these Dutch hacker events. Between 1989 and 1993 I published Hack-Tic, a magazine not unlike 2600 except that it was written in Dutch. During the late Hack- Tic years I co-founded XS4ALL, which still is one of the larger ISPs in The Netherlands. I guess I became part of the hacker community sometime during the early 1980s while playing with my fathers 300 baud acoustic modem, although arguably I was hacking before when I was soldering FM- transmitters together with a friend at age 12. But after reading Steven Levy’s book ‘Hackers, heroes of the computer revolution’, I knew what I was and that I was to be part of a global community, even if I could only knew a few other hackers around me. Laura Balver of the Dutch program ‘Ik op TV’ visited Toool Amsterdam. Click to see Dutch clip…. I made the most of my days in Barcelona. From 09:00 to 19:00 I was behind the booth at the 3GSM show, never to return home before 01:00 from meetings with Spanish lockpickers and locksmiths. Very generous people I met, as I ended up with 55 kilo’s(!) of locks and blanks. Enough to keep me busy for quite some time…. Normally I would not have been able to transport all this precious metal. 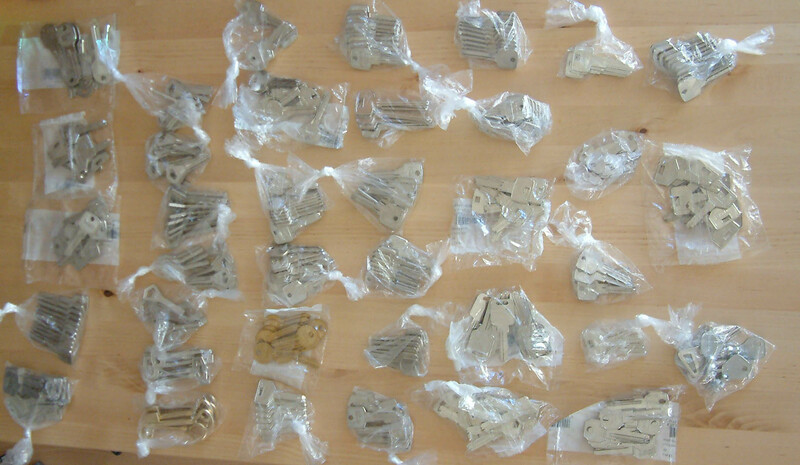 Luckily for me, a Dutch friend (Vincent ‘Norman’ Vlaming) was doing his internship at our company, and he and his father helped me out by taking kilos and kilos of locks in their luggage. 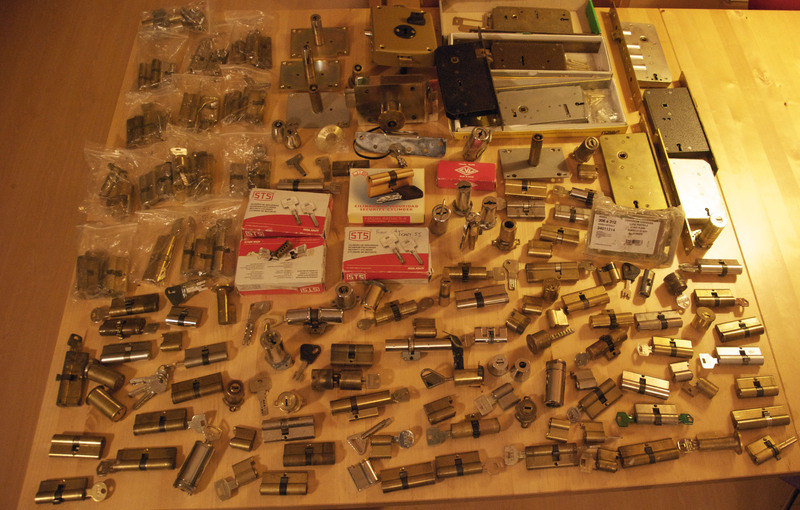 But back to Spanish locks: A high number of lever locks are in use there, as well as lots of dimple locks. Some of the lever locks (Orenco for example) have something remarkable. 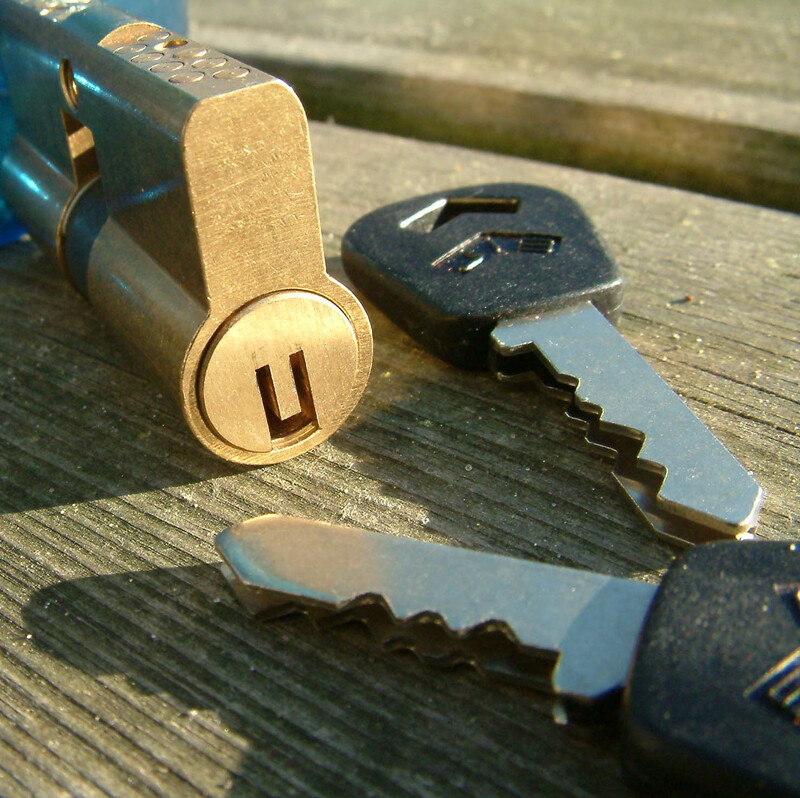 The keys miss a small part at the bottom, making the lower finger of the key stick out a little. 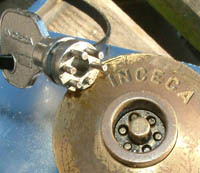 This is the part that keeps the lock under pressure. This is a cheap and simple counter measure to avoid opening the lock using a classic hobbs pick. 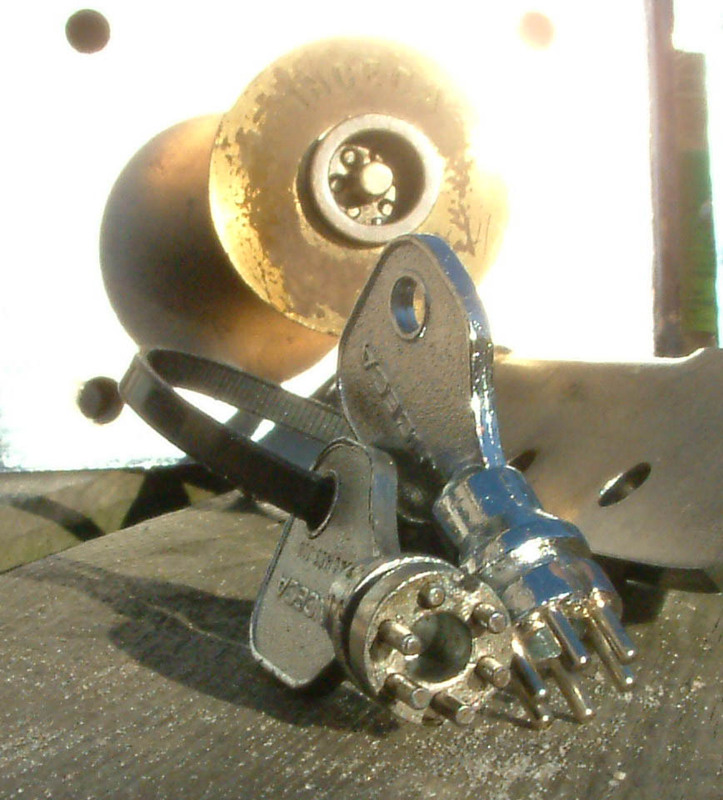 There just is no room for the tensioner of the Hobb’s pick, as a little ring deep inside the lock takes away all the space. 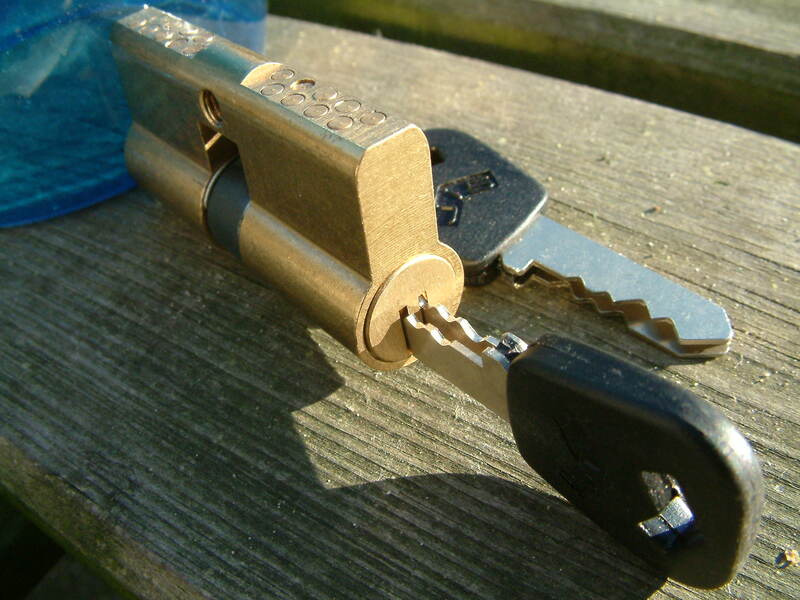 As it is a popular lock, of course there is a pick for it. And I got a demonstration of it. Unfortunately I did not shoot any photo’s, but it is a classical Hobb’s pick and … a hollow file (tube shaped). 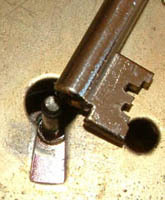 The file is inserted into the lock and the ring at the bottom of the lock is simply filed away. 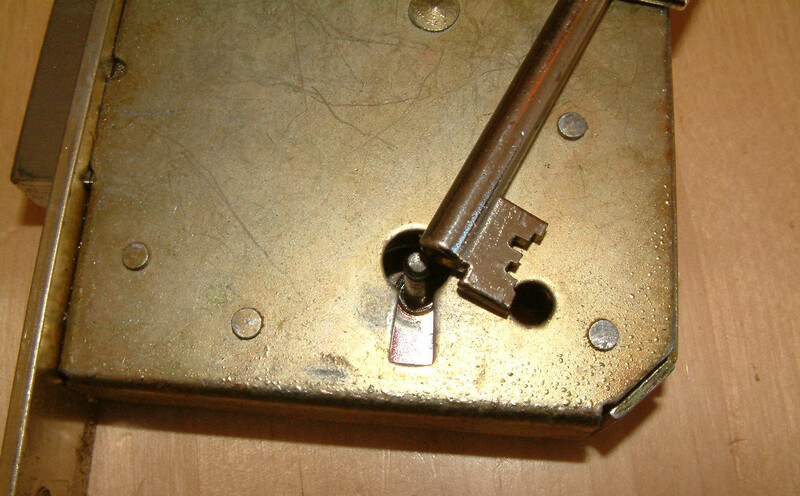 After removing that part, the classic Hobb’s pick can be used to open the lock. I have also seen some special and remarkable models. 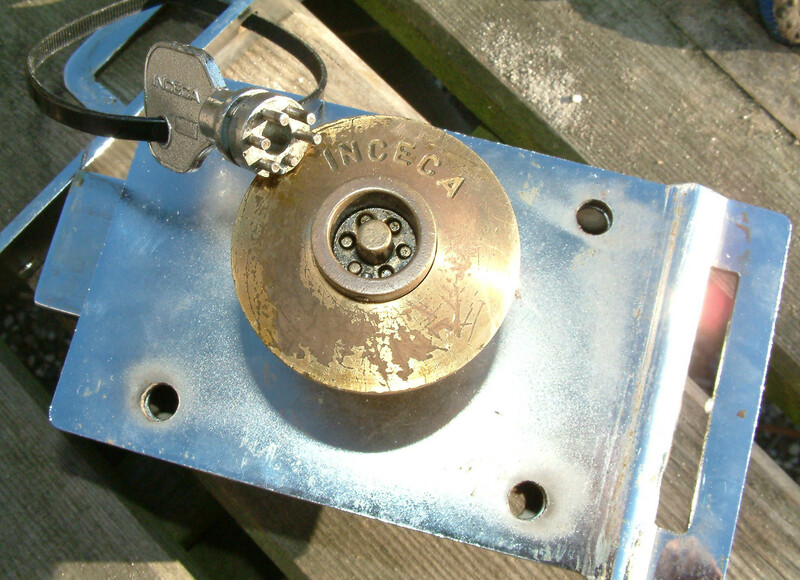 Take for instance this Inceca lock with it’s round key. I have not tried, but people told me it can be opened relatively quickly with a sort of tubular pick. Another special lock was the JIS, with it’s two rows and nine pins. The good news is I met a local locksmith yesterday that gave me a ‘small present’ … A box containing 25 Kilograms of locks! There are some real treasures in this big box, and when I am back in Amsterdam I will make some nice detailed images of some of them. The blanks I brought with me cover 50% of the (pin tumbler) locks I received. Not a bad score. 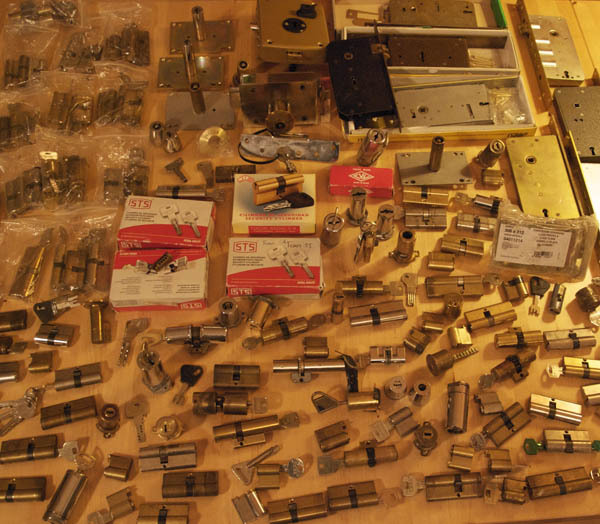 Tonight I will try to impression a few locks, and teach the friendly locksmiths the basics of impressioning…. End of the week I will be visiting Barcelona for a couple of days. 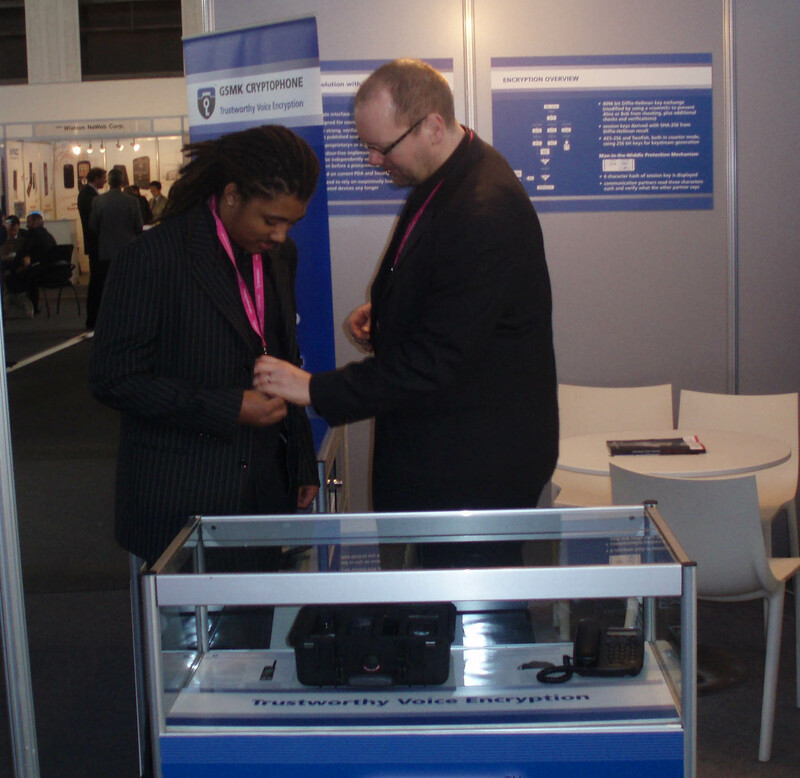 To be more precise, from Sunday 10 to Thursday 14 February I will be at the CryptoPhone stand at the 3GSM show. Whenever I travel abroad I try to estimate the most common locks and order (ten of each of) the most popular blanks. In case of Spain I understood they use a lot of dimple locks like TESA T-60 and T-80, MCM 4SE, CISA, STS (CS-5, CS-6, CS-8 etc), ISEO, Ezcurra S-10 and DS-15 and LINCE. So I collected around twenty different type of blanks. Of course this is not enough to cover all the locks, but I hope it covers some of them. 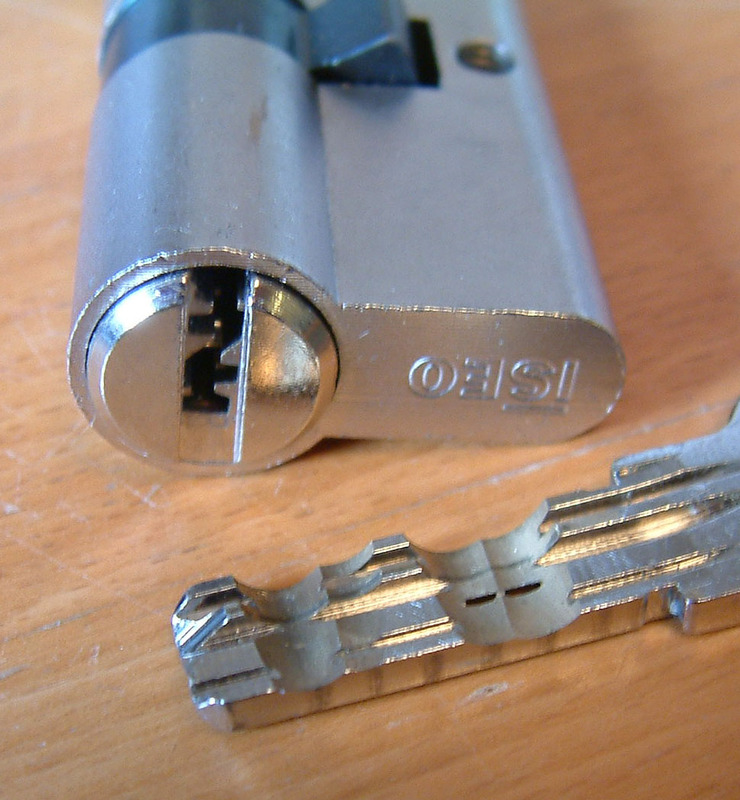 As far as I see, Impressioning dimple locks is the same as impressioning a ‘normal’ pin tumbler locks. Problem is I only tried around ten different locks (Iseo, Lips, Dom, Keso, Abus, Mul-t 7X7 etc). And except the mul-t-lock 7X7 I succeeded in opening all of them. 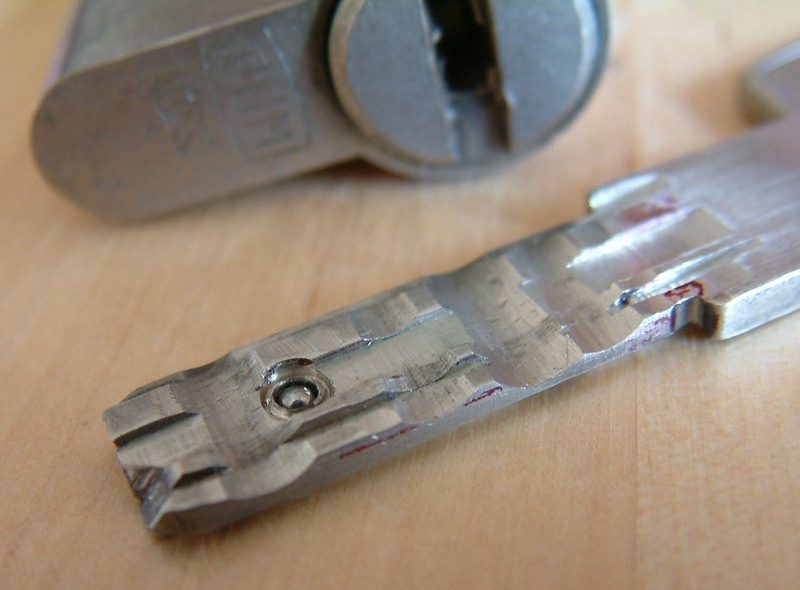 I hope to get my hands on some (used) spanish dimple locks while there and be able to practice some more. Are there Spanish blackbag readers that would like to meet for a cup of coffee, and maybe trade locks and/or blanks? I will be staying in the Plaza EspaÃƒÂ±a area in Barcelona. Advice on what other locks/blanks are popular in Spain is welcome too, please use the comments (or mail me: barry at toool.nl) if you have any info…. I must admit I have been so busy last week that making the sunday evening deadline was not easy. I was planning on writing something about Marc Tobias his hack on alarm systems. The weak spot are the wireless sensors (operating on 433.92 Mhz). Maybe I will get back to that later. Today I want to talk about some of the fun things at Toool: factory visits! Dutch lock company Anker invited us last year for a factory visit. Even while most of the well respected brands on the market have lots of their parts made in China, Dutch lock company Anker is an exception. They still do most of the work in their own factory, and are very proud of that. At least in the Netherlands they are unique in that respect. 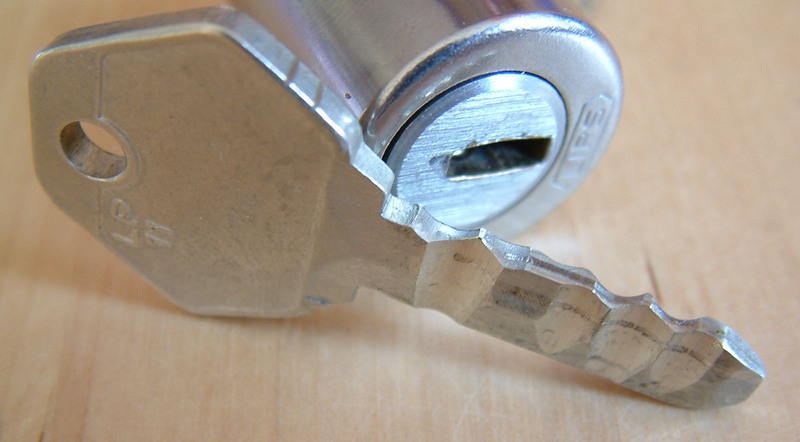 The following video will show you how the key profile is cut into a lock core. Anker is known by us lockpickers by their nasty to pick profiles: very narrow, lot of zig-zag’s and six pins. Not completely impossible, but by no means easy. In this video you will learn how the profile is cut in the lock core (quicktime or youtube). Entries (RSS) and Comments (RSS). 43 queries. 0.329 seconds.